Declan is a little blue horned monster, whose potential scariness is softened by his shoe-button eyes and the pink pom-pom on his tail. And he is a little monster who finds everything in the forest exciting--especially four rabbits--shaped and colored like jelly beans. The four bunnies, however, are not so pleased to meet up with him. To them, Declan is a scary-looking dude, and they hop off frantically and hide behind the trees. Oh, nooo! They're gone! Declan is dejected. He liked those bunnies!!! He tries to distract himself by greeting other new things in the woods. But while Declan broods, the bunnies, each peeping stealthily from behind a tree, become more intrigued with Declan's interest. Just as the little monster slumps down against a tree to mope more effectively, one brave bunny approaches and taps him on the shoulder. Happy hops and hugs ensue, Declan is delighted with his new bunny buddies... until he spots something NEW! In his latest, Bunnies!!! (Katherine Tegen Books, 2015), Kevan Atteberry features an appealing little monster whose toddler-like enthusiasms turn from one thing to another quickly. Atteberry's bright pastels and roly-poly characters, set forth in four-panel pages and double-page spreads, make this story especially attractive to mercurial preschoolers, who well understand the attraction of the next new thing. 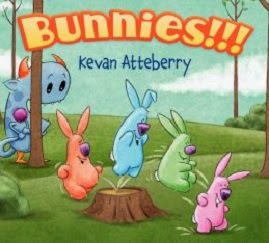 Other books illustrated by Kevan Atteberry include Josie Bissett's Tickle Monster and Boogie Monster. (see my review here).